The 485 Valet by Benchmade is a medium size folder and a great choice for everyday carry. 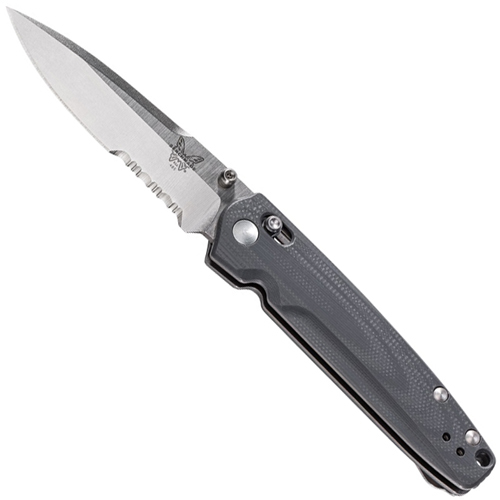 It features a 2.96" M390 super premium stainless steel blade and gray contoured G10 handles. Solid AXIS lock lockup and a reversible deep-pocket carry clip. M390 is a super-performance blade steel with exceptional cutting ability and wear resistance. Because of its uniform microstructure and stainless properties, M390 is often used in surgical cutting instruments and other applications that require a high finish. The G10 handles are extremely durable made up of layers of fiberglass soaked in resin, then highly compressed and baked. Impervious to moisture or liquid and physically stable under climate change. The 485 Valet is just a great overall choice for anyone looking for a quality knife with premium materials and quality craftsmanship. The AXIS Lock mechanism is a patented Benchmade exclusive and has been turning heads and winning fans ever since its introduction. A 100-percent ambidextrous design, AXIS gets its function from a small, hardened steel bar which rides forward and back in a slot machined into both steel liners. The bar extends to both sides of the knife, spans the liners, and is positioned over the rear of the blade. It engages a ramped, tang portion of the knife blade when it is opened. Two omega style springs, one on each liner, give the locking bar its inertia to engage the knife tang. As a result, the tang is wedged solidly between a sizable stop pin and the AXIS bar itself.